For other uses, see Silo (disambiguation). "Grain tower" redirects here. For the English gun tower, see Grain Tower. A silo (from the Greek σιρός – siros, "pit for holding grain") is a structure for storing bulk materials. Silos are used in agriculture to store grain (see grain elevators) or fermented feed known as silage. Silos are more commonly used for bulk storage of grain, coal, cement, carbon black, woodchips, food products and sawdust. Three types of silos are in widespread use today: tower silos, bunker silos, and bag silos. There are different types of cement silos such as the low-level mobile silo and the static upright cement silo, which are used to hold and discharge cement and other powder materials such as PFA (Pulverised Fuel Ash). The low-level silos are fully mobile with capacities from 100 to 750 tons. They are simple to transport and are easy to set up on site. These mobile silos generally come equipped with an electronic weighing system with digital display and printer. This allows any quantity of cement or powder discharged from the silo to be controlled and also provides an accurate indication of what remains inside the silo. The static upright silos have capacities from 200 to 800 tons. These are considered a low-maintenance option for the storage of cement or other powders. Cement silos can be used in conjunction with bin-fed batching plants. Cement can be stored in different types of Silos like Horizontal Mobile Silos, Concrete Silos, Steel Panel Silos etc. depending upon the requirement of the end user. While Mobile Silos come in a relatively small storage capacity of approximately 90MT of Cement, Concrete Silos can store practically thousands of MT of Cement. A majority of Silos that store more than 5000 MT of Cement are constructed from Concrete. A good compromise between cost, construction time and ease of operation is Steel Panel Silos. These silos can be manufactured in a factory, and then erected at site using small panels that are bolted together to form a Silo that is watertight because of a sandwiched layer of special rubber seals. Storage silos are cylindrical structures, typically 10 to 90 ft (3 to 27 m) in diameter and 30 to 275 ft (10 to 90 m) in height with the slipform and Jumpform concrete silos being the larger diameter and taller silos. They can be made of many materials. Wood staves, concrete staves, cast concrete, and steel panels have all been used, and have varying cost, durability, and airtightness tradeoffs. Silos storing grain, cement and woodchips are typically unloaded with air slides or augers. Silos can be unloaded into rail cars, trucks or conveyors. Tower silos containing silage are usually unloaded from the top of the pile, originally by hand using a silage fork, which has many more tines than the common pitchfork, 12 vs 4, in modern times using mechanical unloaders. Bottom silo unloaders are utilized at times but have problems with difficulty of repair. An advantage of tower silos is that the silage tends to pack well due to its own weight, except in the top few feet. However, this may be a disadvantage for items like chopped wood. The tower silo was invented by Franklin Hiram King. 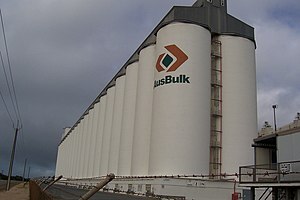 In Canada, Australia and the United States, many country towns or the larger farmers in grain-growing areas have groups of wooden or concrete tower silos, known as grain elevators, to collect grain from the surrounding towns and store and protect the grain for transport by train, truck or barge to a processor or to an export port. In bumper crop times, the excess grain is stored in piles without silos or bins, causing considerable losses. High contrast image showing the intermeshed concrete staves, and how the lower hoops are aligned over the stave edges. Small stave silos can be expanded upward. More hoops are added to strengthen the lower staves. Concrete stave silos are constructed from small precast concrete blocks with ridged grooves along each edge that lock them together into a high strength shell. Concrete is much stronger in compression than tension, so the silo is reinforced with steel hoops encircling the tower and compressing the staves into a tight ring. The vertical stacks are held together by intermeshing of the ends of the staves by a short distance around the perimeter of each layer, and hoops which are tightened directly across the stave edges. The static pressure of the material inside the silo pressing outward on the staves increases towards the bottom of the silo, so the hoops can be spaced wide apart near the top but become progressively more closely spaced towards the bottom to prevent seams from opening and the contents leaking out. Concrete stave silos are built from common components designed for high strength and long life. They have the flexibility to have their height increased according to the needs of the farm and purchasing power of the farmer, or to be completely disassembled and reinstalled somewhere else if no longer needed. Low-oxygen silos are designed to keep the contents in a low-oxygen atmosphere at all times, to keep the fermented contents in a high quality state, and to prevent mold and decay, as may occur in the top layers of a stave silo or bunker. Low-oxygen silos are only opened directly to the atmosphere during the initial forage loading, and even the unloader chute is sealed against air infiltration. It would be expensive to design such a large structure that is immune to atmospheric pressure changes over time. Instead, the silo structure is open to the atmosphere but outside air is separated from internal air by large impermeable bags sealed to the silo breather openings. In the warmth of the day when the silo is heated by the sun, the gas trapped inside the silo expands and the bags "breathe out" and collapse. At night the silo cools, the air inside contracts and the bags "breathe in" and expand again. While the iconic blue Harvestore low-oxygen silos were once very common, the speed of its unloader mechanism was not able to match the output rates of modern bunker silos, and this type of silo went into decline. Unloader repair expenses also severely hurt the Harvestore reputation, because the unloader feed mechanism is located in the bottom of the silo under tons of silage. In the event of cutter chain breakage, it can cost up to US$10,000 to perform repairs. The silo may need to be partially or completely emptied by alternate means, to unbury the broken unloader and retrieve broken components lost in the silage at the bottom of the structure. In 2005 the Harvestore company recognized these issues and worked to develop new unloaders with double the flow rate of previous models to stay competitive with bunkers, and with far greater unloader chain strength. They are now also using load sensing soft-start variable frequency drive motor controllers to reduce the likelihood of mechanism breakage, and to control the feeder sweep arm movement. Bunker silo being filled and compacted. Bunker silos are trenches, usually with concrete walls, that are filled and packed with tractors and loaders. The filled trench is covered with a plastic tarp to make it airtight. These silos are usually unloaded with a tractor and loader. They are inexpensive and especially well suited to very large operations. 8' diameter by 150 foot silo bag shown just after filling and sealing. Bag silos are heavy plastic tubes, usually around 8 to 12 ft (2.4 to 3.6 m) in diameter, and of variable length as required for the amount of material to be stored. They are packed using a machine made for the purpose, and sealed on both ends. They are unloaded using a tractor and loader or skid-steer loader. The bag is discarded in sections as it is torn off. Bag silos require little capital investment. They can be used as a temporary measure when growth or harvest conditions require more space, though some farms use them every year. A bin  is typically much shorter than a silo, and is typically used for holding dry matter such as cement or grain. Grain is often dried in a grain dryer  before being stored in the bin. Bins may be round or square, but round bins tend to empty more easily due to a lack of corners for the stored material to become wedged and encrusted. The stored material may be powdered, as seed kernels, or as cob corn. Due to the dry nature of the stored material, it tends to be lighter than silage and can be more easily handled by under-floor grain unloaders. To facilitate drying after harvesting, some grain bins contain a hollow perforated or screened central shaft to permit easier air infiltration into the stored grain. Sand and salt for winter road maintenance are stored in conical dome-shaped silos. These are more common in North America, namely in Canada and the United States. Fabric silos are constructed of a fabric bag suspended within a rigid, structural frame. Polyester based fabrics are often used for fabrication of the bag material, with specific attention given to fabric pore size. Upper areas of silo fabric are often manufactured with slightly larger pore size, with the design intent of acting as a vent filter during silo filling. Some designs include metal thread within the fabric, providing a static conductive path from the surface of the fabric to ground. 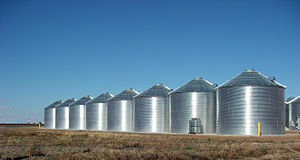 The frame of a fabric silo is typically constructed of steel. Fabric silos are an attractive option because of their relative low cost compared to conventional silos. However, when fabric silos are used to store granular or particulate combustible materials, conventional practices prescribed by established industry consensus standards  addressing combustible dust hazards can not be applied without a considerable engineering analysis of the system. Ancient Greek vases shaped as grain silos, 700/650 BC, Kerameikos Archaeological Museum, Athens. Silo 3.5 miles southeast of Blooming Grove Texas built c: 1900 by F. B. Cumpston. Used mainly for corn. Archaeological ruins and ancient texts show that silos were used in ancient Greece as far back as the late 8th century BC, as well as the 5th Millennium B.C site of Tell Tsaf, Israel. The term silo is derived from the Greek σιρός (siros), "pit for holding grain". The silo pit, as it has been termed, has been a favorite way of storing grain from time immemorial in all oriental lands[clarification needed]Asia. In Turkey and Persia, usurers used to buy up wheat or barley when comparatively cheap, and store it in hidden pits against seasons of dearth. In Malta a relatively large stock of wheat was preserved in some hundreds of pits (silos) cut in the rock. A single silo stored from 60 to 80 tons of wheat, which, with proper precautions, kept in good condition for four years or more. The first modern silo, a wooden and upright one filled with grain, was invented and built in 1873 by Fred Hatch of McHenry County, Illinois, USA. Forage silo filling is performed using a forage harvester which may either be self-propelled with an engine and driver's cab, or towed behind a tractor that supplies power through a PTO. The harvester contains a drum-shaped series of cutting knives which shear the fibrous plant material into small pieces no more than an inch long, to facilitate mechanized blowing and transport via augers. The finely chopped plant material is then blown by the harvester into a forage wagon which contains an automatic unloading system. Tower forage filling is typically performed with a silo blower which is a very large fan with paddle-shaped blades. Material is fed into a vibrating hopper and is pushed into the blower using a spinning spiral auger. There is commonly a water connection on the blower to add moisture to the plant matter being blown into the silo. The blower may be driven by an electric motor but it is more common to use a spare tractor instead. A large slow-moving conveyor chain underneath the silage in the forage wagon moves the pile towards the front, where rows of rotating teeth break up the pile and drop it onto a high-speed transverse conveyor that pours the silage out the side of the wagon into the blower hopper. Silo bags are filled using a traveling sled driven from the PTO of a tractor left in neutral and which is gradually pushed forward as the bag is filled. The steering of the tractor controls the direction of bag placement as it fills, but bags are normally laid in a straight line. The bag is loaded using the same forage harvesting methods as the tower, but the forage wagon must be moved progressively forward with the bag loader. The loader uses an array of rotating cam-shaped spiraled teeth associated with a large comb-shaped tines to push forage into the bag. The forage is pushed in through a large opening, and as the teeth rotate back out, they pass between the comb tines. The cam-shaped auger teeth essentially wipe the forage off using the steel tines, keeping the forage in the bag. Before filling begins, the entire bag is placed onto the loader as a bunched-up tube folded back on itself in many layers to form a thick pile of plastic. Because the plastic is minimally elastic, the loader mechanism filling chute is slightly smaller than the final size of the bag, to accommodate this stack of plastic around the mouth of the loader. The plastic slowly unfurls itself around the edges of the loader as the tube is filled. The contents of the silo bag are under pressure as it is filled, with the pressure controlled by a large brake shoe pressure regulator, holding back two large winch drums on either side of the loader. Cables from the drum extend to the rear of the bag where a large mesh basket holds the rear end of the bag shut. To prevent molding and to assure an airtight seal during fermentation, the ends of the silo bag tube are gathered, folded, and tied shut to prevent oxygen from entering the bag. Removal of the bag loader can be hazardous to bystanders since the pressure must be released and the rear end allowed to collapse onto the ground. View of silo unloader doors, silage drop tube, and paddle conveyor leading into barn. Interior view of silo unloader conveyor paddles and drive chain. View of doors under shroud. Due to the limited space, the door hinge frame is also the ladder. On the right is the unloader power cable and yellow silage drop tube with removable access doors for insertion of the silage drop spout. View of the silo unloader drop chute inserted into the very top of the silage drop tube 60ft up. The tube is illuminated by light entering through fiberglass panels every 20ft along the outer steel shroud. Electric winch for raising and lowering silo unloader. 50 amp, 250 volt unloader power socket, with shroud to keep out debris. A silo unloader specifically refers to a special cylindrical rotating forage pickup device used inside a single tower silo. The main operating component of the silo unloader is suspended in the silo from a steel cable on a pulley that is mounted in the top-center of the roof of the silo. The vertical positioning of the unloader is controlled by an electric winch on the exterior of the silo. For the summer filling of a tower silo, the unloader is winched as high as possible to the top of the silo and put into a parking position. The silo is filled with a silo blower, which is literally a very large fan that blows a large volume of pressurized air up a 10-inch tube on the side of the silo. A small amount of water is introduced into the air stream during filling to help lubricate the filling tube. A small adjustable nozzle at the top, controlled by a handle at the base of the silo directs the silage to fall into the silo on the near, middle, or far side, to facilitate evenly layered loading. Once completely filled, the top of the exposed silage pile is covered with a large heavy sheet of silo plastic which seals out oxygen and permits the entire pile to begin to ferment in the autumn. In the winter when animals must be kept indoors, the silo plastic is removed, the unloader is lowered down onto the top of the silage pile, and a hinged door is opened on the side of the silo to permit the silage to be blown out. There is an array of these access doors arranged vertically up the side of the silo, with an unloading tube next to the doors that has a series of removable covers down the side of the tube. The unloader tube and access doors are normally covered with a large U-shaped shield mounted on the silo, to protect the farmer from wind, snow, and rain while working on the silo. The unloader is typically lowered only a half-inch or so at a time by the operator, and the unloader picks up only a small amount of material until the winch cable has become taut and the unloader is not picking up any more material. The operator then lowers the unloader another half-inch or so and the process repeats. If lowered too far, the unloader can pull up much more material than it can handle, which can overflow and plug up the blower, outlet spout, and the unloader tube, resulting in a time-wasting process of having to climb up the silo to clear the blockages. Once silage has entered the conveyor system, it can be handled by either manual or automatic distribution systems. The simplest manual distribution system uses a sliding metal platform under the pickup channel. When slid open, the forage drops through the open hole and down a chute into a wagon, wheelbarrow, or open pile. When closed, the forage continues past the opening and onward to other parts of the conveyor. Computer automation and a conveyor running the length of a feeding stall can permit the silage to be automatically dropped from above by each animal, with the amount dispensed customized for each location. Defunct silo in Merrinee, Victoria, Australia. Silos are hazardous, and people are killed or injured every year in the process of filling and maintaining them. The machinery used is dangerous and with tower silos workers can fall from the silo's ladder or work platform. Several fires have occurred over the years. Filling a silo requires parking two tractors very close to each other, both running at full power and with live PTO shafts, one powering the silo blower and the other powering a forage wagon unloading fresh-cut forage into the blower. The farmer must continually move around in this highly hazardous environment of spinning shafts and high-speed conveyors to check material flows and adjust speeds, and to start and stop all the equipment between loads. Preparation for filling a silo requires winching the unloader to the top, and any remaining forage at the base that the unloader could not pick up must be removed from the floor of the silo. This job requires that the farmer work directly underneath a machine weighing several tons suspended fifty feet or more overhead from a small steel cable. Should the unloader fall, the farmer will likely be killed instantly. Unloading also poses its own special hazards, due to the requirement that the farmer regularly climb the silo to close an upper door and open a lower door, moving the unloader chute from door to door in the process. The fermentation of the silage produces methane gas which over time will outgas and displace the oxygen in the top of the silo. A farmer directly entering a silo without any other precautions can be asphyxiated by the methane, knocked unconscious, and silently suffocate to death before anyone else knows what has happened. It is either necessary to leave the silo blower attached to the silo at all times to use it when necessary to ventilate the silo with fresh air, or to have a dedicated electric fan system to blow fresh air into the silo, before anyone attempts to enter it. In the event that the unloader mechanism becomes plugged, the farmer must climb the silo and directly stand on the unloader, reaching into the blower spout to dig out the soft silage. After clearing a plug, the forage needs to be forked out into an even layer around the unloader so that the unloader does not immediately dig into the pile and plug itself again. All during this process the farmer is standing on or near a machine that could easily kill them in seconds if it were to accidentally start up. This could happen if someone in the barn were to unknowingly switch on the unloading mechanism while someone is in the silo working on the unloader. Often, when unloading grain from an auger or other opening at the bottom of the silo, another worker will be atop the grain "walking it down", to ensure an even flow of grain out of the silo. Sometimes unstable pockets in the grain will collapse beneath the worker doing the walking; this is called grain entrapment as the worker can be completely sunk into the grain within seconds. Entrapment can also occur in moving grain, or when workers clear large clumps of grain that have become stuck on the side of the silo. This often results in death by suffocation. There have also been many cases of silos and the associated ducts and buildings exploding. If the air inside becomes laden with finely granulated particles, such as grain dust, a spark can trigger an explosion powerful enough to blow a concrete silo and adjacent buildings apart, usually setting the adjacent grain and building on fire. Sparks are often caused by (metal) rubbing against metal ducts; or due to static electricity produced by dust moving along the ducts when extra dry. The two main problems which will necessitate silo cleaning in dry-matter silos and bins are bridging and rat-holing. Bridging occurs when the material interlaces over the unloading mechanism at the base of the silo and blocks the flow of stored material by gravity into the unloading system. Rat-holing occurs when the material starts to adhere to the side of the silo. This will reduce the operating capacity of a silo as well as leading to cross-contamination of newer material with older material. There are a number of ways to clean a silo and many of these carry their own risks. However, since the early 1990s acoustic cleaners have become available. These are non-invasive, have minimum risk, and can offer a very cost-effective way to keep a small particle silo clean. Dagon, Haifa, Israel - transformed into a museum of agriculture, a prominent local feature. Three types of wheat silos, Delungra, New South Wales. ^ One or more of the preceding sentences incorporates text from a publication now in the public domain: Zimmer, George Frederick (1911). "Granaries" . In Chisholm, Hugh (ed.). Encyclopædia Britannica. 13 (11th ed.). Cambridge University Press. p. 336. ^ Eric Sloane's An age of barns. MBI Publishing Company. ^ Graham, Judith (2011-03-08). "Drowned in corn: Grain bin deaths hit record". Chicago Tribune. Wikimedia Commons has media related to Silos. Look up silo in Wiktionary, the free dictionary. Beedle, Peggy Lee. "Silos: an agricultural success story", University of Wisconsin-Extension: 2001, G3660-4. This page was last edited on 25 March 2019, at 17:03 (UTC).